I’m in Nottingham this morning. I have a hangover. I can’t understand why. I had two small cans of Foster’s last night. That’s all. I don’t ever enjoy a hangover but I can at least accept one when there’s good reason. I’m drinking less and less these days. I suppose my reluctance to swallow large quantities of mood altering liquid has something to do with the fact that, thanks to my lifestyle, I’m more than happy with my state of mind most of the time. Maybe it’s not a hangover. Maybe I’m just suffering because neither Sally nor I slept very well last night. There was no gentle quacking from nearby mallards or screeches from chaotic coots, no swish as the wind brushed the bowing bull rushes against the boat, no quiet squeak from the rubber fenders caught between the boat’s hull and the wooden jetty. And no soothing rocking enticing us closer to our dreams. Nothing. Just a regular sized bed – a very large bed by boating standards – in a room isolated from the much loved sounds of nature by very effective double glazing. Double glazing with windows we couldn’t open because they were locked and our hosts had gone to bed. The unpleasant heat didn’t help achieve a restful night either. Sally and I are used to sleeping in the coldest part of the boat. We’re quite happy, and very comfortable, with a temperature of twelve or thirteen degrees. The radiator in our room last night was on all night. We couldn’t turn it off. Much as I love the company of Sally’s daughter Maricar and her partner Ollie, I’ll be glad to get back to our beloved boat tonight. Occasionally, and very briefly, I think that this boating lark is too much like hard work. But on the rare nights when we are away from James I can’t wait to get back to tranquillity. My head’s clearing a bit now – I think it was just lack of much needed fresh air in the bedroom – so on with the important stuff. I’ve been receiving an increasing number of emails with suggestions for newsletter content. They’re all very welcome. I’ll gladly consider all the suggestions you want to throw at me so if there’s something about narrowboat life you want to know, and you think it worthy of a mention in the newsletter, please let me know. I had more than my share of condensation issues when I first moved on to James. The boat had been moored in the marina since 1997 when it was bought from the original owner by my boss, Roger Preen. He used it very little. In 2006 he moved James from Calcutt’s Locks marina to the boat’s new berth in the brand new Meadows marina. The new location offered a better view on a more spacious mooring. The mooring also offered full exposure to the prevailing south westerly and the rain it carried over the four years before I moved on board. The wind and the rain scoured the port side until the paint hung off the boat in ribbons showing the Masonite underneath. Maronite is a fibreboard and because it’s fibreboard it doesn’t react very well to exposure to the elements. The sheet joins had started to swell and curl allowing water through the joints in the roof and on the port side which bore the full brunt of the prevailing wind. In anything heavier than a light shower I had to empty the kitchen cupboards of pots and pans to place under the drips through the ceiling. There was water damage to the Parana pine cladding in both the dining and bedroom areas. The curtains were mouldy as were the bench seat covers and the mattress. Rain found other ways into the boat too. There’s a hinged steel hatch in my small trad stern deck to allow access to weed hatch. There’s a drain to catch any rain which finds its way through the hatch edges. The drain was blocked so years of rain falling onto the back deck had overflowed the drain channel into the engine bay. The water had then passed through a hole in the bulkhead between the engine room and bedroom soaking the underside of the wooden flooring in the bedroom. When I moved on board the boat was very damp indeed. I bought a Dehumidifier DD122FW-Mk4 . For the first month on board I had it on every minute of every day. It soaked up gallons and gallons of water. Unfortunately I didn’t realise then that I was wasting my time. The dehumidifier was fighting a losing battle trying to deal with the constant inflow of water from the engine room. I didn’t realise at the time how much the dehumidifier cost to run either. I’ve cured the leak in the engine room now so I’ll be very interested to see how much moisture the dehumidifier collects this winter. We haven’t used it yet, but we will before the month is out. We try to use it sparingly because it isn’t cheap to run. At 500w it’s too much of a drain on the batteries, so we power it via the shore line. Electricity at Calcutt is charged at £0.20 per kwh so the dehumidifier costs 10p per hour to run. The month I had it on full time in 2010 my electricity bill for the dehumidifier alone was £72. Now we tend to have it on for just a couple of hours a day in the winter. I was going to tell you that we haven’t started using it yet this year but while I was writing the newsletter Sally brought the dehumidifier back from our storage unit. I had it running for ten hours yesterday in our bedroom with all the doors and the windows closed so that only moisture from the room itself was removed. The dehumidifier removed a very impressive and slightly worrying 1.9 litres. The cost of extracting nearly half a gallon of unwanted water was £1.00 and was money very well spent. The duvet, mattress and pillow cases are now noticeably lighter and drier. The room feels warmer and more cosy. The damp has crept up on us over the summer months. I’ll need to run it now at least a week until the spring. The dehumidifier didn’t totally cure the damp problems in the bedroom. We had an ongoing problem with our mattress (and no, it has nothing to do with the fact that I’ve reached a certain age). The underside was constantly damp. Actually it was more wet than damp. I had read that drilling holes in the bed base to allow air to circulate would cure the problem. Our bed base already had holes in it so we had to look for another solution. We found the cure in an online nautical mattress store. ShipShape Bedding sell a very effective and rather expensive anti condensation layer you cut to shape and lay between your mattress and the bed base. The company claim that the results are astonishing. They’re right. It works. Our mattress is far, far dryer now than it’s ever been. The first step in curing the damp of course had to be making sure that the boat was watertight. I did that by sending James away to have the Masonite cabin over plated with steel. When the boat returned two weeks later I had my first in-at-the-deep-end experience of narrowboat painting. The aesthetic result was passable but my main goal of ensuring that James was completely protected from the weather was achieved. Once we knew that no more rain was going to further damage the interior, we bought a new mattress, had all the seats recovered and Sally spent a week hunched over her sewing machine to knock up eleven pairs of curtains. We now have a dry and mostly warm boat. I say mostly warm because the only heat source is the stove which is on the starboard side about three feet from the front of a forty seven feet long cabin with doors across the boat to section off the bathroom (and to also ensure that virtually no heat reaches the back end of the boat). There’s a radiator in the bedroom fed by the stove’s back boiler but as the radiator is gravity fed, and as the pipe that runs between the stove and the radiator forty feet away, the water is lukewarm at best. Consequently the bedroom is really the only part of the boat which now needs a blast with the dehumidifier every now and then. A final aid to minimise moisture build up is ensuring that we have roof and door vents open at all times, even in the depths of winter, and the windows open when and where practical. Just to finish off, here’s a comment on the subject by Waterway’s World technical editor Mark Langley I’ve copied from their web site. “Good levels of ventilation is the key! If you are living aboard, then plenty of high and low level vents are very important. If the moisture has nowhere to go, it will condense out, causing mould, woodwork distortion, etc. Another important point is keeping the air warm, preferably with a source of dry heat (like solid fuel stoves, or radiators). Gas cookers produce large amounts of moisture, as does washing, showering, or even just breathing! You need to be achieving total air changes of greater than 4 times the internal volume, per hour. Solar vents can be useful, but better on unattended craft. Anhydrous calcium chloride crystals will only absorb around 1 litre of water per 500g crystals. Considering that the 230V mains dehumidifier (which consumes 200W from the land line) can easily, in winter, extract 5 litres of moisture per 24hours, the crystal ones are next to useless on boats! If you live aboard in winter, seriously consider a mains dehumidifier. If you don’t stay aboard, leave a couple of windows open and ensure that your ventilation is up to scratch! This is another suggestion sent in to me. The Association of Continuous Cruisers is less than a month old but they already claim to have secured cheaper winter moorings for continuous cruisers. I emailed John Sloan asking for more information. He’s kindly sent me their press release. I also asked him how many members they currently have and how many they hope to attract in the fullness of time. I haven’t received an answer from him. At just £10 for a year’s membership it’s certainly worth looking into. I’ve reproduced the press release below along with John’s email address if you want more information. The Association of Continuous Cruisers is a newly-formed independent organisation, officially launching on the 27th September 2013. As well as providing support and advice to its members, the Association intends to advocate for the interests of all its members. Britain’s 5,000 continuous cruisers enjoy a lifestyle that is distinctive due to both the benefits and restrictions that accompany boating without a designated home mooring, which is protected and regulated by Section 17 of the British Waterways Act 1995. The Association of Continuous Cruisers feels that many of the issues that continuous cruisers face (such as access to medical treatment, and the provision of winter moorings) are unique to continuous cruisers, and the Association intends to provide advocacy and support to its members in tackling these and other day-to-day issues. One of the core tenets of the Association of Continuous Cruisers’ mission is to represent the interests of its members and ensure that the Canal & River Trust hear their voices, by building a positive working relationship with the Trust in perpetuity. A number of continuous cruisers successfully negotiated with the Canal & River Trust earlier in 2013 to change the allocation process and pricing structure for online winter moorings, resulting in lower-priced winter moorings being available to all continuous cruisers for the winter of 2013/2014. One of the main aims of the Association of Continuous Cruisers is to raise awareness of the positive role that continuous cruisers play within the wider waterways community, and challenge negative perceptions about the reality of the role of the continuous cruiser. Regular meetings for Association of Continuous Cruisers members will be held across the waterways system, with members and potential members encouraged to keep in touch online, and by spreading the word to other boaters that they meet on their travels. Roving traders such as coal boats and other cruising businesses that cover large parts of the network will also be used to spread the word and keep the Association’s members up to date. The official launch of the newly-formed Association of Continuous Cruisers on the 27th September 2013 will coincide with the Birmingham Floating Market event on the same date, which is organised by continuous cruisers to highlight the contribution that roving traders make to the canal system. This site has been created using the web’s most popular content management software, WordPress. It’s the web’s most popular management software because it’s not only very good at what it does but it’s also free to use. WordPress excels in many, many areas but it lets the side down a bit when it comes to its default site search facility. Quite frankly, it’s rubbish. I’ve always been frustrated with the very poor results it returns but I’ve been too busy to do anything about it… until last week. I’ve taken the bull by the horns and installed Google Custom Search Engine (CSE). Google CSE makes a huge difference to finding information on what is now quite a large site. With over 500 posts and pages on the main part of the site and 3,500 posts on the forum, you could spend hours trawling through the various categories and indexes. All that has changed now. The Google site search engine does its job very well indeed. I spent half an hour playing around with it yesterday and found stuff I had forgotten I’d written. The new search engine is in the same place as the old one at the top of the right hand column on the main part of the site. You can’t see it when you’re on the forum, But if you click on the “Home” link just below the forum search box you’ll be taken to the site’s home page where you’ll see the search box at the top on the right. Use the search facility on the home page from now on rather than the search box on the forum page. The forum search only searches though the forum posts but the Google search box searches the main part of the site and the forum. One of the many pleasures of traveling the UK’s canal and river network is the ability to take life as slowly as you like. Dawdling is encouraged rather than criticised. Taking it easy is the name of the game and it’s a game we all want to play. We all want to take it easy… until we switch to the virtual waterways network online. Then we want everything in front of us as quickly as possible. Browser dawdling is not tolerated. I launched this site on 19th February 2010. As I’ve mentioned, the site has been developed using the WordPress content management system. It’s a wonderful tool which allows users with no web design experience (me) to put together functional and aesthetically pleasing sites. And because WordPress is the most popular content management system in the world, thousands of skilled developers have written blocks of code which plug in to WordPress to enhance its functionality. These blocks of code (they’re called plugins) are free to download and install on a WordPress website and they can enhance a site in a bewildering number of ways. They can also cause a site considerable problems. Over the last three and a half years I’ve read about and installed many plugins which have taken my fancy. The forum itself is a very sophisticated plugin. The software which controls users access to paid products is another. The site has been enhanced in many different ways. Each plugin usually, but not always, works well in isolation, but sometimes conflicts with other plugins on the site. Even if there are no conflicts on the site, the more plugins you have, the more resources they use and the slower the site runs. I had far too many plugins and, as a direct result, the site was starting to run more and more slowly. I slow site is no good for you when you’re browsing, and it’s no good for me when I’m clicking from page to page and post to post when I’m adding content. With that in mind, I’ve had an early and very thorough spring clean. I’ve deactivated 75% of the plugins on the site. The site is now loading three times faster than it was when you received the last newsletter so browsing for both you and I should be far easier from now on. To be honest, I don’t know what some of the plugins actually did. I’ve had a quick look around the site. Everything which should be working appears to be doing its job properly but I would appreciate a second opinion if you have the time. Please let me know if you notice anything either missing or not working. Just send me a quick email to let me know. Thank you. I know it’s hard to believe. After all, this site now has over 4,000 posts and pages so I think it’s fair to say that it offers you a comprehensive resource when you want to find information about narrowboats and life afloat. But I have to say, there’s another larger and more detailed resource available to you. Waterway’s World is the UK’s most popular inland waterways magazine. You probably know that. But I bet you didn’t know that if you subscribe to the magazine you get unlimited and free access to articles from every issue over the last ten years? I think my subscription cost me £37 for 12 issues, plus a free Waterways World annual and the third edition of The Narrowboat Builder’s Book. Once subscribed you get unlimited access to every edition since 2004. It’s an incredible resource. 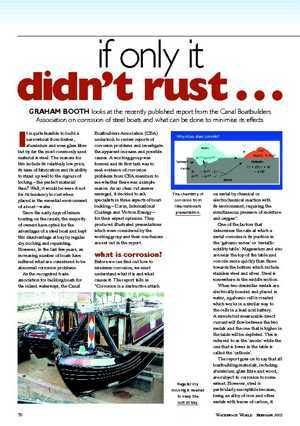 For example, if I wanted to know more about rust on narrowboats (I did) I could do a quick search on the WW site and find a very detailed report written by Graham Booth in February 2005 (left). I would be able to discover everything I wanted to know about steel and how it corrodes and, more importantly, how to prevent it from doing so. I would also find an equally detailed five page article from 2010 about dealing with rust and painting your beloved boat. If you are already a Waterway’s World reader it’s an absolute no brainer to elect to take out an annual subscription, save money on each issue’s cover price, have each publication delivered to your door before it appears in the shops, get a couple of narrowboat books for free and get access to every article written in the magazine over the last decade. You’ll see offers for annual subscription in every edition of Waterway’s World. Make sure you take up their very generous offer next month. I’ve been writing regular newsletters for a couple of years now. During the first year they were every two weeks or so. To be honest, the frequency was a bit hit and miss. My New Year’s resolution, and one that I’m delighted to say that I’ve kept, was to send out a newsletter every Sunday, rain or shine. The hardest part of the process isn’t the writing itself, it’s constantly thinking of new content. The trouble is, I don’t know what you want to read. I think I keep the newsletters reasonably interesting but I don’t know for sure. That’s where I need your help. 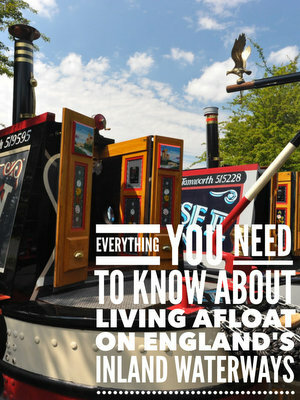 In the last few newsletters I’ve mentioned my new guide Living On A Narrowboat: 101 Essential Narrowboat Articles. It’s a free download as a PDF here. It’s also no available on Amazon as a Kindle download. I’ve tried to make it available free of charge but I can’t work out how to do it so it’s been published at the lowest price setting of £1.99. The Kindle edition is here. I created the site just over three years ago to provide a source of information for anyone interested in narrowboats and the possibility of living on one full time. The site has grown to encompass a comprehensive listing of inland marinas in England and Wales, dozens of articles, a forum and regular newsletters. I’ve already created (below) indexes of the site articles and the more popular forum posts. I thought it was about time I created an easy to use index of the newsletter content. Here’s the index so far. I’ve managed to reach the end of 2012. I’ll add the rest next week. RCR engine servicing – River Canal Rescue (RCR) are well known as the waterways equivelent of the AA but did you know that they will also come to your mooring to service your boat? A disaster – I inadvertantly deleted this week’s newsletter and there wasn’t a backup on the server. What a shame. It was all about the damage you can do to your boat if you don’t watch what you’re doing in a lock. You would have loved it!